Of all Shakespeare’s plays, it’s Hamlet that holds most fascination for audiences, and new productions often make the headlines. In recent years we’ve seen Maxine Peake at the Royal Exchange in Manchester in 2014, Benedict Cumberbatch’s production staged at the Barbican in 2015 and Paapa Essiedu at the RSC in 2016. Each was notable in its own way. Rolling through all three years was Dominic Dromgoole’s production that toured to almost 200 countries around the world. These production were all notable, each for different reasons that sometimes had little to do with the quality of the acting: with Peake media interest focused on her gender, finding her angry and emotionally direct, one critic noting with some surprise that she was a good fencer. It’s a pity that consideration of Benedict Cumberbatch’s performance received much less media attention than the fact that the famous TV Sherlock had to plead with the audience not to film the show on their mobile phones. His Hamlet, in contrast to his highly intellectual Sherlock, was a case of “arrested emotional development. What we are watching is a man still struggling to grow up”. It was estimated that 250,000 people saw the production either in the theatre or via the relay in cinemas worldwide. In the RSC’s production “the focus is less on politics than on the predicament of a prince who finds himself an outcast in his own land”,Paapa Essiedu a young man “palpably isolated and bereft”. The production was so successful the RSC has now announced it is to go on tour to five regional theatres before heading for London in 2018. The wonder of Dromgoole’s Hamlet was that it happened at all, setting out the seemingly impossible task of performing in every country on earth. They might not quite have managed that, but it was still a considerable feat, and Dromgoole has now written an account of it that focuses on the difficulties of achieving it rather than the production itself, or even international reactions to it. This production too played to over 100,000 people. We never seem to have had too much of Hamlet and in 2017 there have been a new crop. They were discussed on the BBC’s Front Row on 28 August. The only one of the three Hamlets in London this summer that anyone still has a chance of seeing is the three-handed version at the Park Theatre, Finsbury Park with Benet and Gyles Brandreth and Benet’s wife Kosha Engler. It runs until 16 September. Inevitably it’s a family affair, labelled a kitchen sink drama and probably not meant to be taken too seriously. 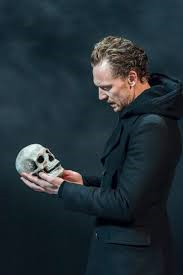 The highest-profile of these is the current production at RADA’s Jerwood Vanbrugh theatre, starring Tom Hiddleston. Directed by Kenneth Branagh (himself a notable Hamlet on several occasions) most media interest has been caused by the fact that it’s virtually impossible to get a ticket. Only 4000 tickets were available for the three-week season from 1-23 September, in a studio seating only 160. They were allocated by ballot (allegedly reviewers had to go through the ballot too through the Guardian’s Michael Billington still got a seat). The idea is to raise funds for RADA though it’s hard to resist the feeling that it would have been easy to make an awful lot more by playing in a larger space or live-streaming it to cinemas. Like Cumberbatch’s production, and venue would have been sold out in hours, and the media attention is again more on the fight for tickets than on the production itself. Having said that, people attending dress rehearsals described the production as a “thriller”, “vibrant” and “the grief Hamlet”. The Guardian commented that the production stresses the domestic rather than the political aspects of the play, and “Tom Hiddleston captures the sweetness as well as the fury”. 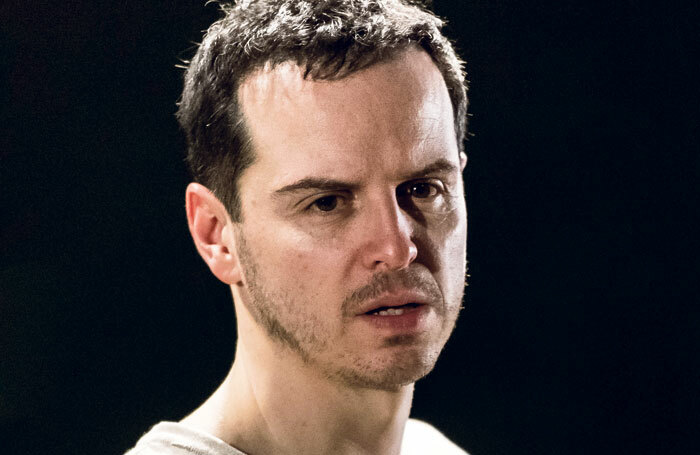 The other London production, now closed, is Andrew Scott’s Hamlet at the Almeida which then transferred to the Harold Pinter Theatre in the West End, closing on 2 September. Famous for other high-profile roles including Moriarty in, again, Sherlock, Scott’s performance has been widely praised and the whole production called “an all-consuming marvel”. Not just about the prince, the production has had a terrific cast including Juliet Stevenson as Gertrude. Elsinore is a place where everybody is being watched, spied on, under surveillance. With the production now having closed, it is great news that it will be screened by the BBC in 2018. No further information is available yet but this link leads to the BBC’s announcement. Who knows how many other gloomy but charismatic Danes will appear on the stage in 2018. This entry was posted in Shakespeare on Stage and tagged Andrew Scott, Benedict Cumberbatch, Benet Brandreth, Dominic Dromgoole, Globe to Globe, Hamlet, Maxine Peake, Paapa Essiedu, Tom Hiddleston. Bookmark the permalink.